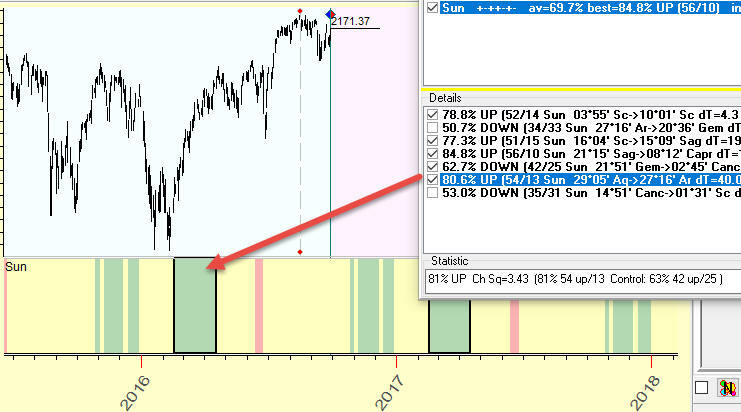 - specify big changes in Sunspot activity index and check if these changes correspond to any significant changes of the price. We have to perform these procedures in any case, just to gather a statistical information. However, very often a trader needs some other information from us. If the scientist is happy to find that the index proposed by him/her with high accuracy correlates to the stock market, the trader is more worried by the state of his/her trading account and needs to know how many successful trades this index provides. Scientific people and traders think in totally different ways. Their needs/goals are different. For example, when Julius Bartels researched the existence of 27 days cycle (which is the Sun self rotation cycle, or the Moon tropical cycle) studying F2 layer ionization data, his goal was to confirm that this cycle is present; only after that fact was established, we could state that "with the probability of 95%, the self Solar rotation (or the Moon tropical cycle) has some effect on F2 ionization". We, as scientists, do not discuss yet the strength of this effect, we just state that this effect is present and we can continue our further research regarding the mechanics of this effect. This is the academic/scientific point of view; its focus is gathering some knowledge. Traders' needs are different - "show me the money!". We can apply Bartels significance test and find that, with the probability of 100%, 57 days cycle (just a made-up example) is present in S&P500 data (it would make academic people happy); from the other side, analyzing trading opportunities of this 57 days cycle, we may find (also a made-up example) that we cannot outperform the stock market while trading this cycle (traders are not happy). My point is: we cannot apply blindly any standard math procedures for the stock market (like Bartels significance test), if we want to give traders some useful tools. Somehow we need to lose our academic virginity; or, in other words, we need to find another math with different axiomatic system where our main focus is not to gather some new knowledge from the Universe; instead, our focus should be in gathering money from the stock market. To move in that direction, I have suggested Terra Incognita project several years ago and developed some modules of Timing solution under that project. As an example, one of those modules is Q Spectrum ( http://www.timingsolution.com/TI/16/index.htm ). Changing the focus from academic research to traders' needs, we change totally the landscape of math techniques/tools/software/procedures that can be applied to finance and markets. I personally consider the tools that fit for a trader as able to catch market profit pretty much the same way as raptors are catching their prey. One raptor with quick reaction just comes and takes it, exactly as our Q Spectrum (it catches newly born cycles as early as possible); another one may sit in the bushes knowing its prey's patterns and takes it at the river bank (it would be our Q Box module's predictable zones, the short periods when we can actually forecast stock market behavior). Academic wizards may spent all this time looking for one more pattern or cycle while the prey is already gone. "Wizards vs. Raptors"??? To finish this subject, I would like to point at just one fact that tells me that this approach is correct. This is the fact that Q Spectrum module specifies INVERTED cycles, it sees inverted cycles while classical spectrum does not see them. As you see, highlighted 80% accuracy strategy represents these pieces of knowledge gathered by Q Box: when the Sun passes 29 Aquarius - 27 Aries zone of Zodiac, the price tends to go UP. For SNP500, since 1950 the price went UP 54 times versus 13 DOWNS when the Sun was in that area of Zodiac. This is 60% (501 ups vs. 324 downs) accuracy model. When the angle separation between the Moon and the Sun varies between 331 and 32 degrees, the price tends to go up: price went UP 500 times tversus 324 times DOWN. 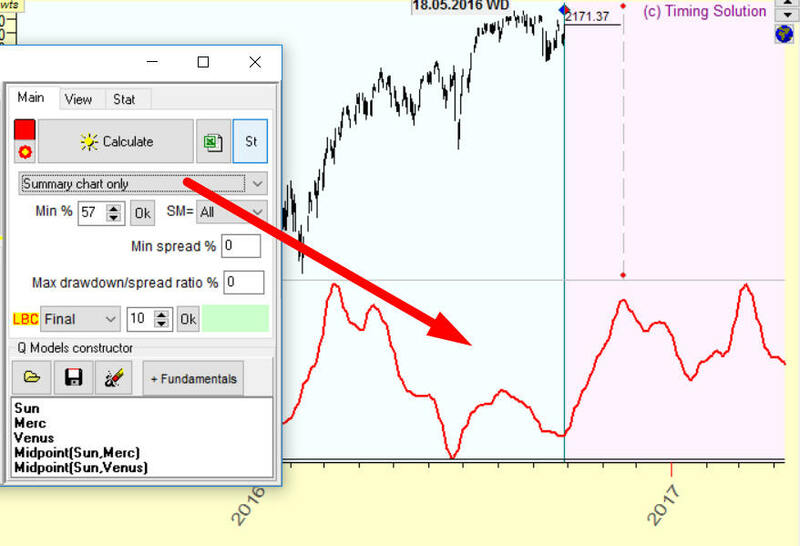 Let's create something totally different, let's try to trade Sunspot activity index. 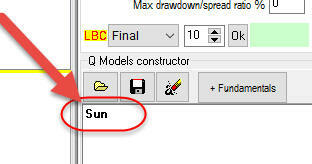 I will not discuss the question how to forecast Sunspot activity to trade with it. Take it as a model example because instead of Sunspot activity index you can use any dataset. You may try to trade using these datasets as other examples: the Moon tidal force, outside temperature or pressure, Lake Ontario water level, etc. It tells us that when Sunspot index varies in the range of 14-26, the price tends to go UP 58% (467 ups vs. 334 downs). 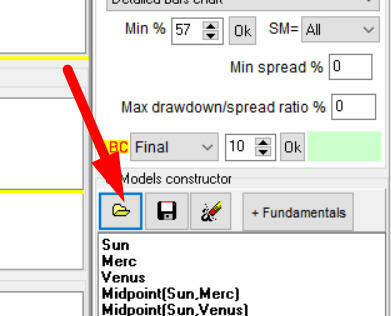 If you type Mercury, the program will calculate predictable zones for Mercury geocentric position. There is also a possibility to use midpoints in your analysis, but you should be very cautious with them. Remember: do not use midpoints that contain 180 degrees jumps. For example: when your calculate Sun/Jupiter midpoint, we may face a 180 jump. It means when the angle separation between the Sun and Jupiter reaches 180 degrees, the midpoint jumps to a smaller arc. In other words, the planets that form some midpoint should not have a 180 degree aspect, Q Box does not work with 180 degrees jumps. In other words, you should only use these planets (geo) in midpoints: the Sun, Mercury and Venus. These planets do not form an opposition. which is the angle separation between the North Node and the Ascendant. 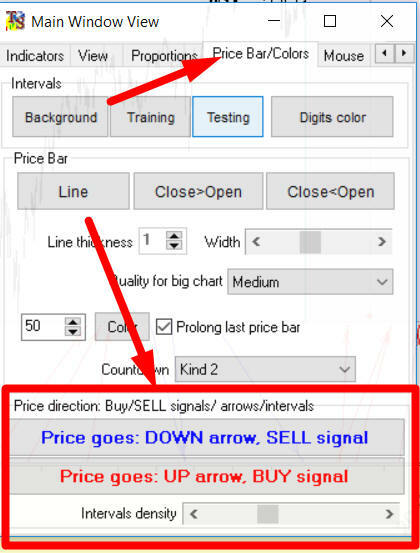 You can use cusps for INTRADAY chart only. Cusps, the North Node and White Moon can be used for geocentric chart only. 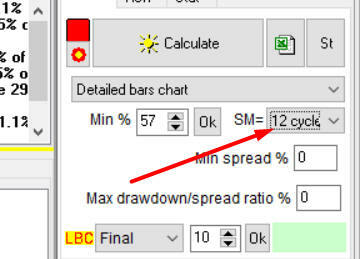 Here I set stock memory for this cycle, SM=20 for, i.e. 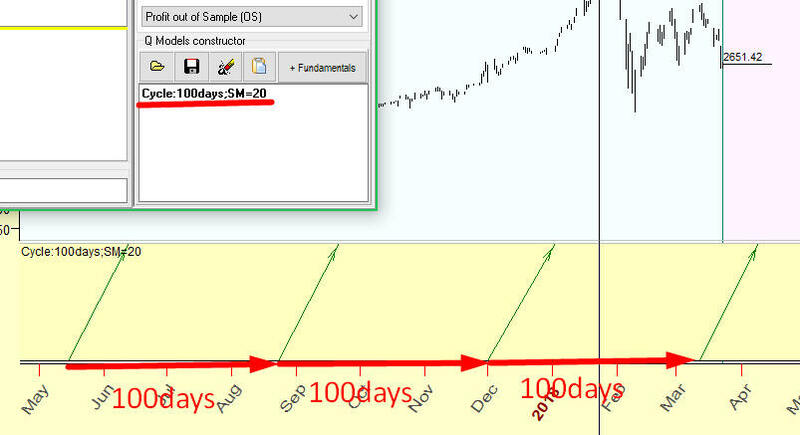 program analyses last 20*100=2000 calendar days of price history. 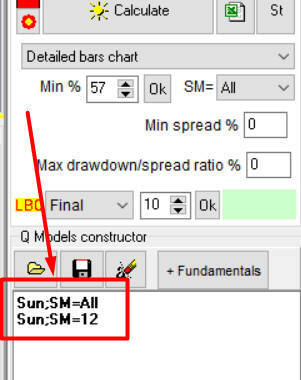 In this case, to find predictable zones for the Moon position, the program will use the price history that corresponds to the last 12 full Moon cycles, i.e. about one year of the price history. 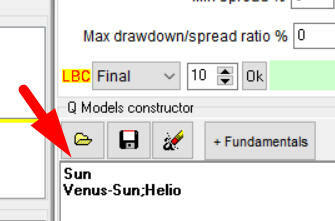 In this case, to calculate Moon Q-box module, the program will use last 4 years of the price history. This is the most important option, it helps to handle the situation when some cycle does not work all the time the same way. Usually I analyze SM=All first; this way I try to catch permanent cycles (cycles that work all the time the same way); after that set SM=12 to catch cycles that work for the last 12 full Moon cycles. 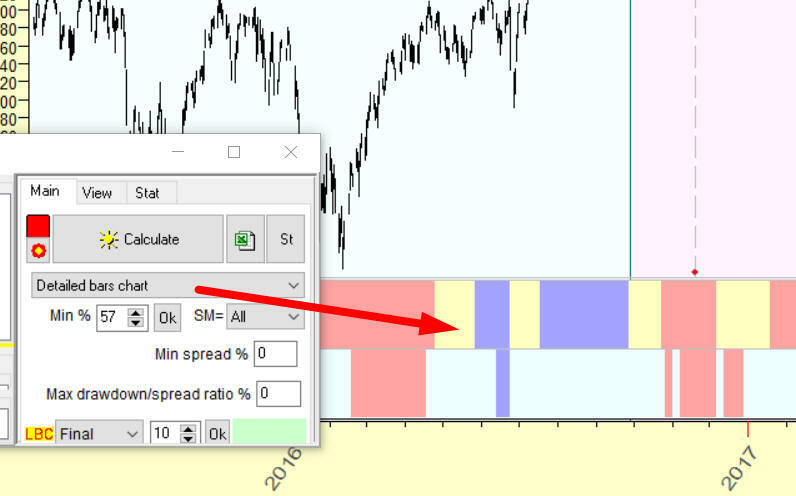 Here we have calculated predictable zones that are confirmed by all available price history and the last 12 years. I recommend setting it to 50%, then click "Calculate" and after that increase the accuracy value (increase % and click "Ok") and watch how the strategy changes in the Main screen. 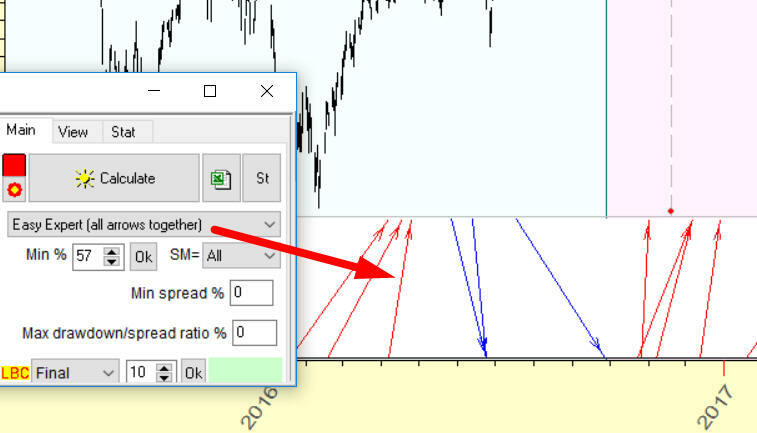 Different views- this option provides several opportunities to display predictable zones. 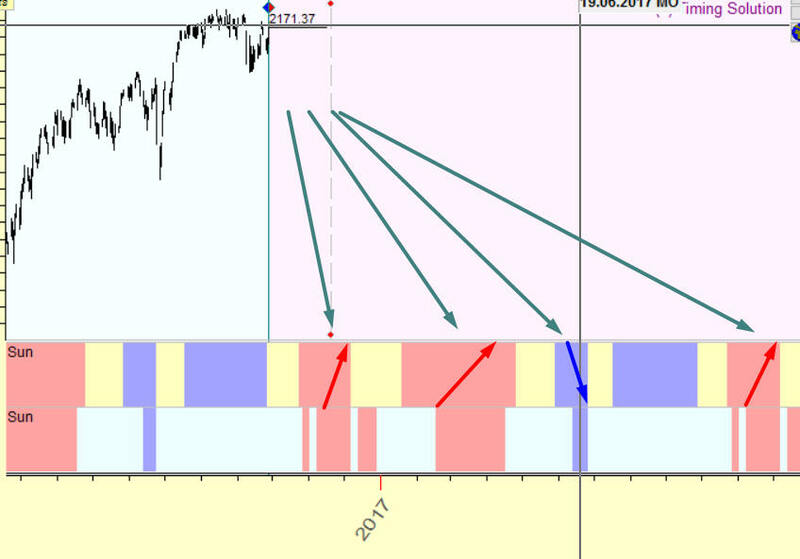 For that chosen model, the program has calculated 10 Annual, kind of Annual and a-la Annual cycles and display predictable zones for these 10 cycles. Also it shows a summary line that represent summary results. This feature is explained in the next section. 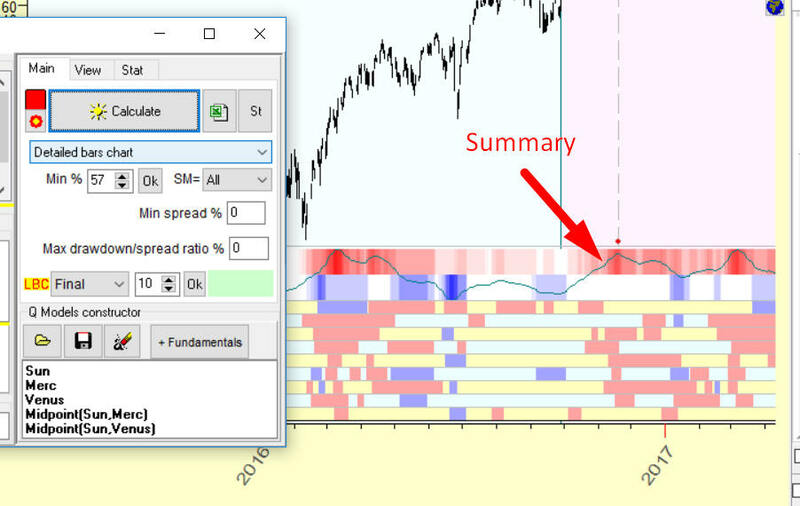 I highly recommend to work with the summary projection line. I have conducted a lot of tests and have found that this projection line is one of the most reliable. Plus this projection line is built on totally different principles than suggested by other existing modules (Composite, Neural Network, etc). 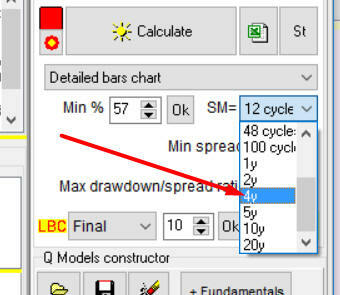 - click "Calculate" to get the summary projection line based on these cycles. 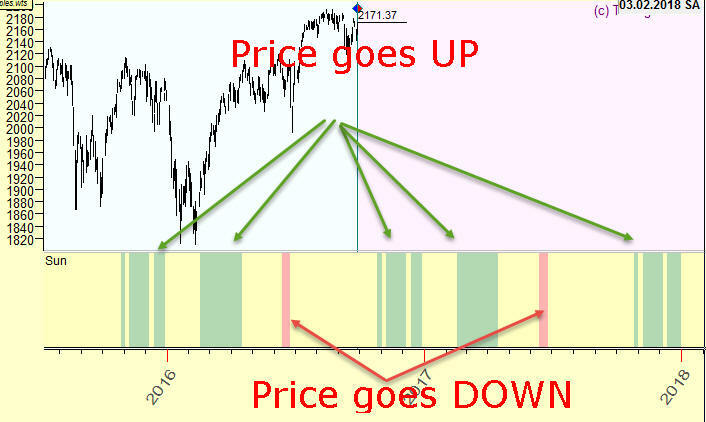 This way we conduct more detailed analysis for our cycles.